White mold is caused by the fungal pathogen Sclerotinia sclerotiorum and can be devastating to a wide range of plant hosts. This fungus is a generalist, meaning that it has a wide host range. Hosts for S. sclerotiorum range from the large-scale production soybean to gardener-cultivated vegetables including tomato, pepper, beans, crucifers/cole crops (cabbage, Brussels sprouts, etc.) and more. This fungus produces white, cottony mycelial (fungal) growth on plant parts, mostly stems, petioles, crowns, or fruits/pods, under conducive weather conditions. 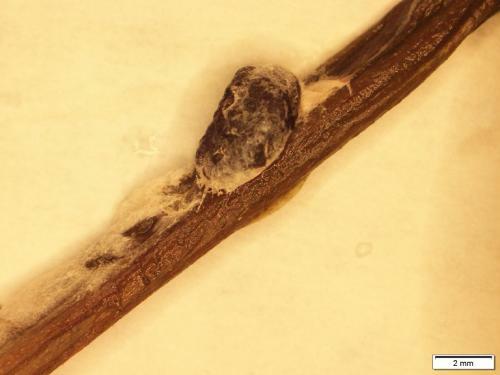 Furthermore, as the fungal growth progresses, small (less than 1-2 cm), irregularly shaped, black fungal masses called sclerotia can be found on or in the plant. The primary symptom seen on plants is an expanding discolored (bleached-to-greyish) lesion on the affected plant part. 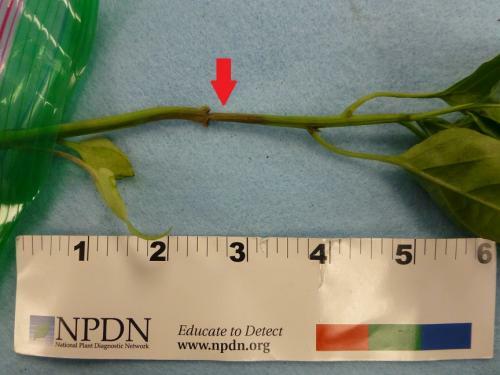 Lesions formed on stems can result in girdling of the stem and subsequent colapse of the plant above the point of infection. Infected petioles can result in defoliation. Fruits and pods that are infected by the fungus will be unmarketable, unsalvageable, and inedible, reducing yields and profit. Sclerotinia sclerotiorum overwinters as sclerotia in the soil for many years. Under ideal conditions, extended periods of cool temperatures (50-70ºF) and moisture, sclerotia within 2 cm of the soil surface germinate to form sexual fruiting structures called apothecia. Apothecia release ascospores, the infection unit of this fungus. The ascospores are disseminated by the wind and germinate when they land on an ideal host in a conducive environment. Disease development by S. sclerotiorum is optimal during cool (less than 80ºF) and wet/humid weather. Maintaining good airflow throughout the plant canopy can help prevent an environment conducive for development of disease caused by S. sclerotiorum. This can be achieved by sufficient row spacing and pruning (when applicable). Additionally, consideration towards watering practices, if any, can help prevent disease development. When flowers on plants are senescing (natural aging) before fruit formation, plants should be watered before noon during the growing season, which allows plants to dry before nightfall and prevents extended periods of wetness on tissues that are easiest to colonize by ascospores. Scouting for this disease in a backyard garden or the field can be as simple as examining plants exhibiting blighting symptoms for discolored lesions or areas near the crown or the collar of the plant. Additionally, white, cottony mycelial growth and /orsclerotia are maybe present on or around the lesion. In larger scale crop production, such as pepper to tomato fields, white mold is not expected to occur in a uniform distribution throughout the field. The disease incidence will be found in an aggregated pattern throughout the field since S. sclerotiorum is a soilborne fungus. thi fungus has windborne ascospores, that can blow from surrounding soybeans. Since sclerotia can survive in the soil for years, removal of infected plant debris can help prevent the future prevalence of the disease by removing or reducing the inoculum source. If plant debris cannot be removed, incorporation of plant debris into the soil at depths greater than 3 cm (1-1.2 inches) can also help, as sclerotia do not produce apothecia at depths greater than 2 cm. 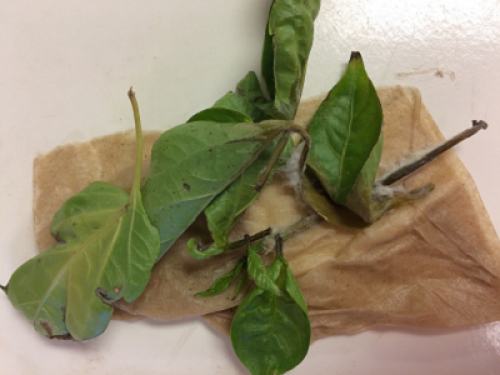 Another sanitation tactic that can help prevent white mold disease development is the management of alternative weedy hosts (i.e. weed management). Since S. sclerotiorum is a generalist, many of the uneconomical hosts include weedy species. By using sufficient weed management practices, reservoirs for the fungus are minimized thus reducing the initial numbers and source of the pathogen. 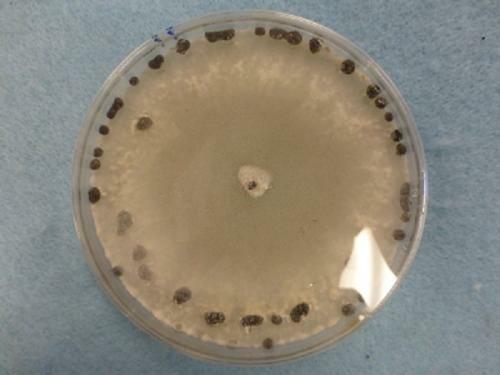 A biological control agent consisting of spores of the mycoparasitic fungus Coniothyrium minitans can reduce S. sclerotiorum inoculum when incorporated into the soil. This agent has the potential lessen the severity of the disease in areas of high disease incidence. The leaves on my lilac are covered with a white substance. Is this a serious problem?